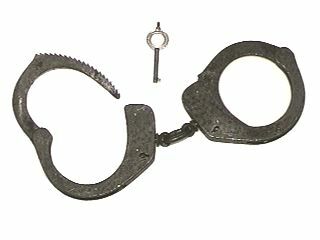 These handcuffs look identical to the Romo Handcuffs cuffs. They differ in at there is a star-shaped cog in the lockcase in front of the latch. This cog prevents any attemp to shim the lock (insert a thin piece of metal between the bow and the latch to disengage the latter and open without the key). Like the Romo's, these don't double lock. They use a standard barrel key (like most modern handcuffs). Also, like the Romo's, there is only a single link between the cuffs.